1. Too Faced Milk Chocolate Soleil Bronzer in Light/Medium - The first thing to hit you when you open the compact is most definitely the scent - chocolate. Yum! And not that sickeningly sweet type of fragrance that nauseates you - this is a scent I can tolerate and actually like. It does dissipate once you apply in case that is a concern. Now on to the texture - like velvet. So smooth, delicate and finely milled that as soon as you dip the brush in powder goes everywhere. But to be honest, that is not a deterrent at all because the formula is so beautiful. I use as a contour or a bronzer and it gives an amazing subtle glow. I will be hitting pan on this for sure. 2. Laura Mercier Matte Radiance Baked Powder in Bronze 02 - Another finely milled powder that has a tendency to disperse everywhere when you dip a brush into it, but as with the Too Faced bronzer the formula is worth it. A bit more shine than the Too Faced, it goes on evenly and does not oxidize. I apply it onto my cheeks and hairline to help give the face a bit of definition and radiance. And after the reviews I keep hearing about the Matte Radiance Highlighter, I think that may be the next piece I buy from this range to pair with the bronzer. My cheekbones are in for a treat, that's for sure. 3. Kevyn Aucoin Celestial Bronzing Veil Tropical Days - This is the boldest of all the four bronzers but I still swoon every time I use it. It has a shimmer that runs through it, as evidenced by the ombre pattern, however when applied to the skin it turns to a beautiful glow rather than an overdone sparkle. I love this bronzer more for the evening, and especially when paired with a sultry smokey eye for added drama. Kevyn Aucoin was always the master of achieving a flawless complexion and this bronzer is no doubt a tribute to that legacy. 4. 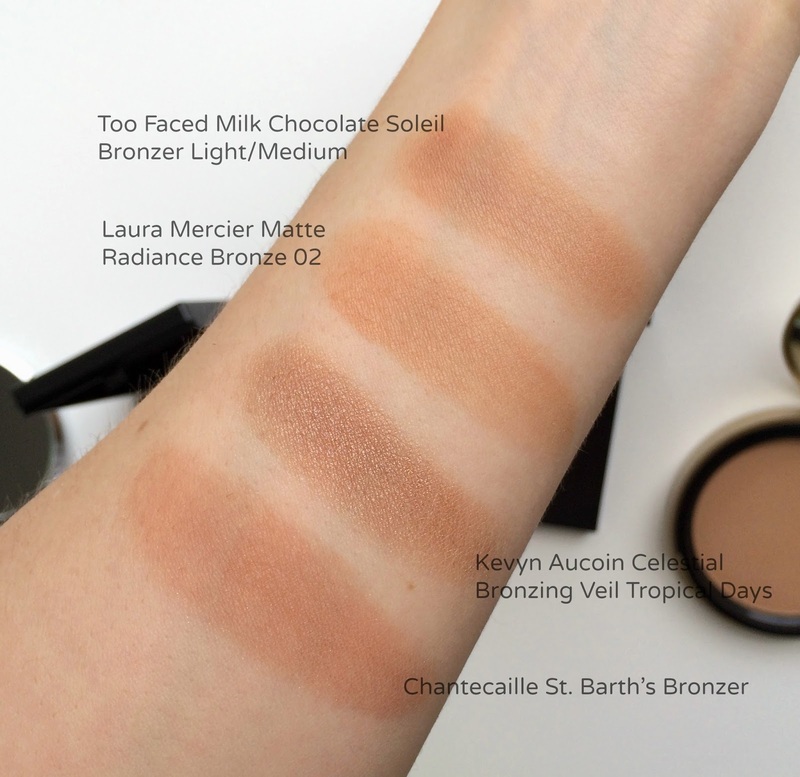 Chantecaille St. Barth's Bronzer - I can't decide which I like more about this bronzer - the packaging or the formula. The mirrored compact is so elegant, as is all Chantecaille packaging that I can't help but feel luxurious when using. It's also the least bulky out of the 4 so undoubtedly it will be with me when I travel. This St. Barth's shade is part of their Summer 2014 collection and definitely has a bit more shimmer than the Too Faced or Laura Mercier, but does not make the face look too shiny or powdered. While I typically dust bronzer along my cheeks and hairline, I find this looks beautiful when worn on the apples of my cheeks as if it were a standard blush. It gives a warmth and brightness that other bronzers tend to turn into a muddy mess if worn on the same part of the face. Another win by Chantecaille, which is quickly solidifying their position as one of my favorite brands of all time. Have you entered my Sunday Riley skincare giveaway??!! It's a good one, trust me. Enter here! What are some of your favorite bronzers? Any I should try? Tell me in the comments below! I love the look of the Kevin Aucoin and Too Faced Chocolate Soliel. My favorite bronzer is Benefit Hoola, but I might have to branch out soon! Great post! I have yet to try any of the Benefit powders so I think it is time I do so! Are there any other shades you like as well? Bronzers terrify me haha. I've found Laura Mercier Dune Bronzer works kind of ok on me but I'll certainly be looking out for those! If you want to start with a real safe one, go with the Too Faced one first. 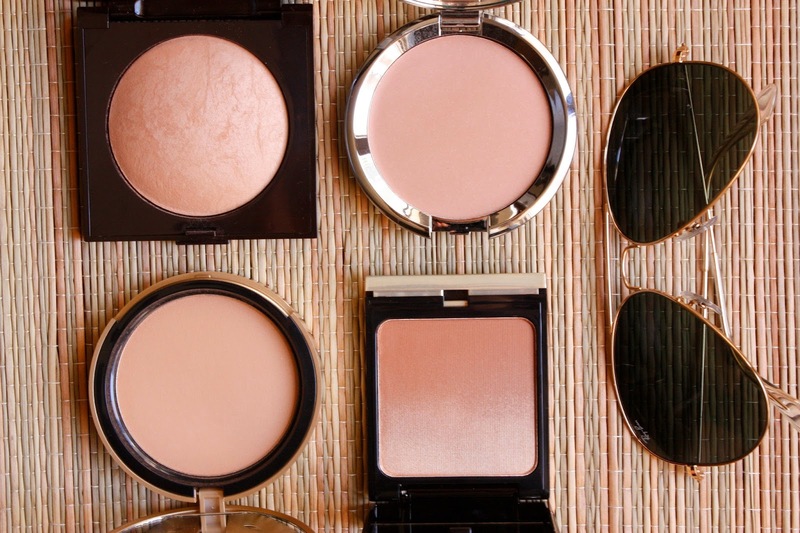 It is so light and easy to use, it is a pale gal's best bronzing friend! I love Laura Geller face and body bronzer in Tahitian Glow. Its not sparkly and you can build the colour up.